“For unto you is born this day in the city of David a Saviour, which is Christ the Lord” (Luke 2:11, KJV). Can you believe it’s December? I don’t know about you, but I heard that some early birds have already put up all their Christmas decorations and then some, turning their homes into winter wonderlands. Mine looks like Charlie Brown’s Christmas at this time since everyone is still too busy to do much Christmas decorating. Yet. What are your favorite Christmas decorations or ornaments? The other day I was on Pinterest, looking at ways to display Christmas villages. I was amazed at the lengths some people go to construct display structures for their Christmas villages. Before we had a cat, I usually put a sheet of fake snow on an empty coffee table, and voila! The outdoor setting was ready to go for my Christmas village. Now that we have a curious cat, we have to be extra careful what he drags off the table and hauls to his water bowl. What about nativities? Do you display them every year? Where? I’ve seen nativities being displayed under a Christmas tree, on the mantel, and just about anywhere. Ours are usually on the mantel, where the crèche is more visible to all. My most precious Christmas item is not a decoration at all. It’s a crown of thorns I bought at a Christian bookstore many years ago. When we first had it, we displayed it around Easter time to remind us of the crucifixion of Jesus Christ on the cross as the complete payment for our sins. We displayed it at Christmas time to remind us of why the Lord had to come to earth, born of a virgin, the perfect, sinless sacrifice for us. Eventually, we left the crown of thorns on the mantel year round because every day is a day of thankfulness for what Jesus has done for us. Do you have a crown of thorns in your house? I think the Christian bookstores sometimes sell dried thorns made in Israel. This picture here is not what I have (mine is less spiky). But John 3:16 is why we display a crown of thorns at Christmas. Do you like to read Christmas romances? I do. They’re fun and interesting. 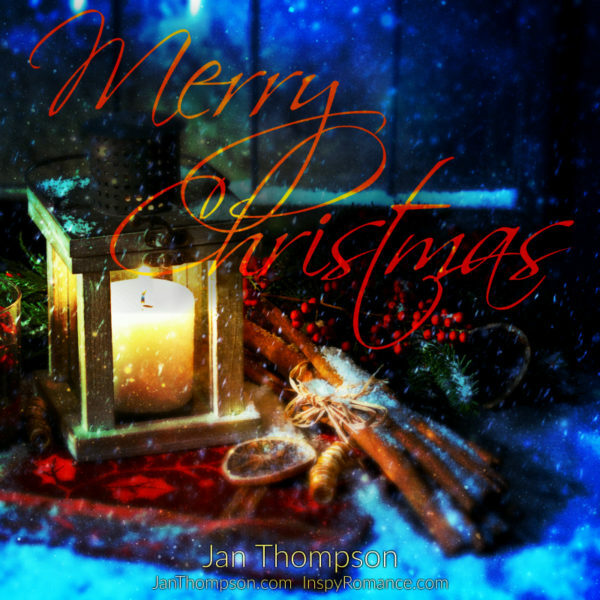 I know that a number of InspyRomance authors have published Christmas books, and you might have read them all. I have only written one Christmas novella, WISH YOU JOY (Savannah Sweethearts Book 9). It’s the story of the two new owners of Christmastown USA and the tug-of-war they’re in all year round just to get through Christmas. Anyway, I wish you and your family a very merry Christmas. Are you traveling to see your family? I will be in town this year. Last year, my son and I visited my widowed mother overseas. Since my husband had to work, he stayed behind and spent time with his own widowed mother. This year, our family is back together again. I look forward to a simple Christmas, and prayerfully one that is sickness-free. How about you? Thank you so much for reading my blog post. May the Lord bless you with amazing memories this Christmas! Stay warm! My favourite decorations are those made by my children many, many years ago. Full of wonderful memories. That’s the best decorations! My mother-in-law still kept Christmas ornaments that my husband and his siblings made many decades ago. Those are certainly keepsakes! Hi Jan and Merry Christmas! Since I watch my very active and curious 22 old month granddaughter my tree isn’t out yet, either have I put out my advent wreath that I displayed on a coffee table. Love reading Christmas stories and watching Hallmark Christmas movies. My favorite Christmas ornament is one my youngest son made in preschool – his thumb print, his teacher made into an adorable mouse. I have several nativity sets which are displayed on the family room mantel and one in the living room. A child’s set for my granddaughters ages 5 and 22 months to play with. Most Christmas decorations are kid friendly this year. Best wishes. That’s wonderful that you’re watching your granddaughter! When my son was young, everything in the house was kid-proof. No glass, no sharp objects, no corners. In fact, our Christmas tree only had non-breakable things for years. Nothing little hands can get cuts on or grab and stuff into mouths, you know! Thank you for commenting and Merry Christmas to you and your family too! Hi Jan, normally the Christmas tree doesn’t go up until school finishes for the year- one more week, but the boys talked us into putting it up last Sunday. The nativity always sits underneath- the boys enjoy arranging it and playing with it, pushing the angel on top to make it sing! My boys are 8 and 10 and are still making ornaments to go on the tree- they are most special. We also enjoy lighting the Advent candles. Hi Wemble! Love that in Australia, folks celebrate Advent and light Advent candles. Sounds like your sons have the Fisher Price Nativity set. My granddaughters enjoy pushing the angel on top. Ours is coming out tomorrow. So the girls can play with it next week. I also have a nativity board book I read to them. Merry Christmas and blessings to you. That’s the one, my mother in law bought it for us when the boys were small and they still love it so out it comes:) I like that even though we are in different countries there are still common traditions. That sounds like a good present to have re: Fisher Price Nativity! I had some toy nativities when my son was little. I can’t remember what happened to them. Over the years we rotated various nativities depending on how much space we have. I wish we had put up the Christmas tree and the outdoor lights back in October when it was still very warm! Today is rainy and 39F in the afternoon, and it’s the worst weather to go outside and hang lights. And the basement (where our Christmas tree still is in several boxes) is cold! I hope it warms up soon, but I hear it will be in the 20s F early next week… Brr! Merry Christmas, ladies! Thank you for sharing your happy Christmas memories with the grandchildren! Almost everything on our tree is handmade. We’ve bought a lot of pieces at craft fairs, but many have also been made by us, our family and friends, and our kids and grandgirls. So many special memories! On Sunday (a week from now) we plan to go out in the mountains with our son, DIL, and their 6yo to find trees for both our houses. Usually we also stop for a little campfire and have a hot dog roast and hot chocolate. Those are the best ornaments re: handmade! Back in the days when I had more time, I used to make a lot of ornaments. I went to town with my hot glue gun. IDK where the glue gun is now, but I do believe we still have a giant tub of handmade ornaments from the 1990s. My son wasn’t into making ornaments, but he did some pottery painting, so I kept those year round on display. The Christmas tree day sounds like fun! I’m sort of allergic to pine, so we have to have artificial trees. Someone joked that maybe I could find pine spray LOL! Not sure what the cat will think of that! Have a merry and warm Christmas, and thank you for the lovely comments! Hi–I think I’m the grinch this year! Not on purpose, though. My hubby and I are empty nesters, and no one comes to our house for Christmas. We spend our day traveling to see our grandchildren, which are local. :) So this year we decided not to decorate. I left it up to my hubby–he says we’ll just be in trouble because we have a new cat—and that little guy is FLYING through this house crazy like. My hubby is afraid it will be all in the tree. I am going to put up a small tree on a table, though. I do like your crown of thorns. What a special reminder of why Jesus was born. Merry Christmas all! But yes, we have a tabletop tree, which our cat doesn’t seem to mind. I hear you re: “flying through this house.” Same here! We might have to tie the Christmas tree to the stair railings just to make sure the cat doesn’t knock it over… I am serious! Merry Christmas and thank you for stopping by! My favorite decorations are handmade by our Son and Daughter. I have a tree made out of coat hangers, plastic bags, tiny bows and ornaments that my aunt made and gave to my sisters and our Mother. I also have a ceramic tree that is way older than I am that was my Grandmother’s. Ooh that is an heirloom re: ceramic tree! That is such a nice thing to have from your grandmother. I don’t have anything from my grandparents because they did not celebrate Christmas. My husband and I are first generation Christians, so any Christmas tradition we learn is from our older previous generation Christian friends from church who have lived godly lives. Otherwise the “Christmas” that everybody else knows from both sides of the family are secular and devoid of Christ. We decided to make our Christmas Christ-centered so we could raise our son in a Christian home. Since we’re first generation Christians, we have a lot to learn over the years, but God always provided older and godly Christians to show us the way! God is so good! All that to say, if you have a wonderful Christian heritage, that is so precious and so much to be cherished! That sounds like a lovely tree made from the heart that your aunt fave you! Those Christmas trees are keepsakes! I come from a long line of Baptists ministers on my Dad’s side of the family. On my Mom’s side, just about everyone is a Christian. I’ve never heard of a first generation Christian. So good to hear that you have some mentors to help you along in your walk with Christ. I have a very eclectic set of tree ornaments :-) I have a little felt gnome ornament that my dad had as a child, which doesn’t have a hanger, so I hide it next to the trunk somewhere on the tree. Then I have quite a collection of cat ornaments people have given me (or I’ve bought). I’ve also ended up with quite a collection of manger scene ornaments, including a blown glass one my husband and I bought in Taiwan over 40 years ago when we were first married. I also have ended up with quite a few nativities. The one my family had when I was a child goes on top of our sideboard, and the carved wooden one my husband and I bought in Taiwan goes on the mantel. The rest are smaller, so go around various places around the living room and dining room. I only got the basic decorations up last week because we had a neighborhood Christmas get-together last Sunday afternoon. We need to get our tree up next week, although it looks like we’ll be away from home for Christmas in order to see our 2 nieces. Margaret, those are lovely Christmas keepsakes from over the years. Such lovely memories too, especially the nativity you had as a child and the ornaments you bought in your first year of marriage. I have a tabletop tree all up now, but that’s because years ago I had hot-glued all the ornaments to the tree, so all I had to do is to plop the tree on the counter! I thought about putting up garlands, but I was quite worried about what our cat would do. Yes, I think if we had an event in our house, the house would be all decorated this year. In fact, next year, I might ask a friend to help. I know at least one friend who loves decorating at Christmas, and I think they begin right after October ends. They are so creative and whatever they touch turn into a winter wonderland… Maybe I could try myself! Thank you for stopping by and have a merry Christmas with your nieces! Merry Christmas. I have just got started shopping..
We have a Porcelain white with gold accents, ( cheap )nativity set that we put under the tree every year and have added angels to it. We hang a star on the tree over the scene. We usually do an Angel tree and add crocheted snowflakes to it with white lights and an small angel on top. Not many other surfaces to decorate. That crown of thorns sounds so appropriate! 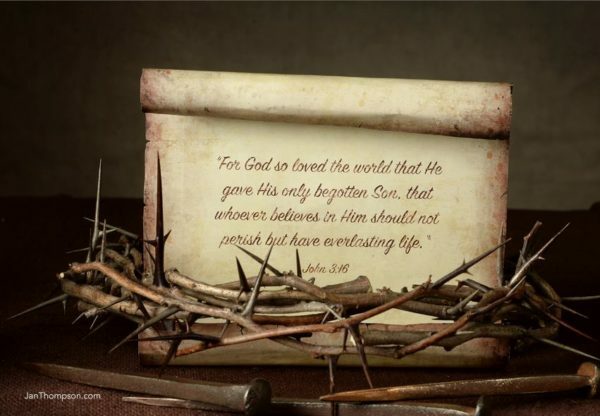 And with the John 3:16 verse it is perfect!